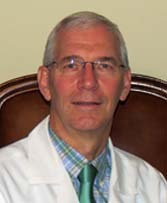 Dr. James Perruquet earned his undergraduate degree at Grove City College in Grove City, PA and his Medical Degree from Hahnemann Medical College in Philadelphia, PA. He completed his internship, residency and fellowship in rheumatology at Geisinger Medical Center in Danville, PA. Dr. Perruquet is a fellow with the American College of Rheumatology. He is board certified in Internal Medicine and Rheumatology. He is accepting new rheumatology referrals from health care professionals.